Japan’s Holy War reveals how a radical religious ideology drove the Japanese to imperial expansion and global war. Bringing to light a wealth of new information, Walter A. Skya demonstrates that whatever other motives the Japanese had for waging war in Asia and the Pacific, for many the war was the fulfillment of a religious mandate. Walter Skya is Assistant Professor of History and Asian Studies at the University of Alaska Fairbanks. 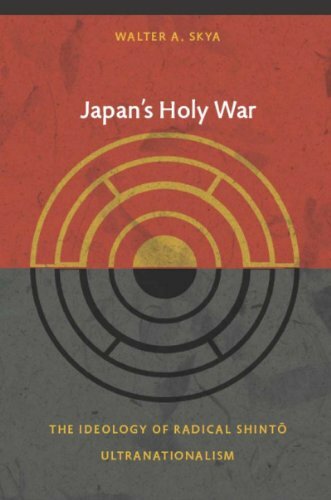 Japan’s Holy War is available directly from Duke University Press, or through Amazon at discounted rates. Totalitarianism seeks fusion of self and society, declaring there shall be no such thing as separation. The totalitarian fantasy is that individual and society are one—that human beings are bound inseparably to their nation. What is totalitarianism? Why did the Axis powers stick together? What did Japan have in common with Germany? This essential book articulates the ideology and psychology underlying Japanese ultra-nationalism. The ideal person, Hozumi explained, is one who desires assimilation into the “higher organic totality” of society. The purpose of ethics and morality is to direct the individual toward kodoshin: submergence of the self into the social totality. Hozumi sought to wage war against Western civilization. This, essentially, was a war against the idea that it is possible for human beings to exist in a condition of separation from society. The bond between the individual and society had to be rock-solid and eternal. Hegel’s theory easily transferred to Japanese society. Uesugi Shinkichi (1878-1929), a constitutional law scholar, also conceived of the state as an organism. In Japan, the emperor was the ultimate source of the nation’s organizational will, representing the ideal embodiment of the state organism. An important thinker shaping religious nationalism in Japan was Kakehi Katsuhiko (1872-1961), who developed the theory of “one heart, same body,” which advocated abandoning the self and offering one’s entire body and soul to the emperor. A true Japanese does not think of self-interest, but rather “forgets one’s own concerns and completely offers oneself to the emperor.” This was especially true for soldiers. When one enlisted in the military, one “died and was reborn again to the armed forces under the command of the emperor.” According to Kakehi, “You give up your life, and do not think for a moment that you are what you are.” One abandoned one’s personal will in order to fulfill the will of the emperor. What is the nature and meaning of this threat of “individualism” that pervaded Japanese political theory? I have found this same idea—that the nation is threatened by individualism—at the heart of Nazi ideology. Why should the idea of individual freedom be conceived as a threat to the existence of one’s nation? Here we encounter a fundamental dynamic revolving around the idea of separation or separateness. Individualism” for the radical nationalist is equated with the idea of separation from the nation, thus disrupting the idea of “one heart, same body.” Totalitarianism revolves around the nation as an actual organism or body politic. Individualism or separateness, therefore, implies the idea of a human being (a body or organism) that is not merged or fused with the national body. What terrifies is the idea that the human body might become separated from—no longer united with—the body politic. Kakehi claims that subjects “cast aside their individual selves and enter into the emperor.” He asserts that all Japanese living at the present time exist inside the emperor, indeed that all Japanese who have ever lived—from the origin of the state onward—exist within the emperor. The emperor, in other words, symbolizes an immortal body in which all Japanese bodies are contained. Skya concludes that the “total assimilation of the individual into a collective body is the goal of all totalitarian movements,” of which Shinto ultra-nationalism was “only one variety.” I agree with this assessment. What’s more, the assimilation of the individual into the collective body is conceived as a moral imperative. The fundamental dictum of totalitarianism is: “There shall be nothing separate from the collective body.” Taking this a step further, one is justified to take measures to kill or destroy those individuals who embrace the heretical view that separation from society is possible. Those who embrace totalitarian ideals, I hypothesize, react with panic and rage to the possibility that anything could exist in a condition of separation from the national body. Ultra-nationalism builds upon a symbiotic fantasy: people and nation are one, the leader and nation are one, the leader and the people are one, the people are merged with one another. Soldiers and Sailors, We are your supreme commander-in-chief. Our relations with you will be the most intimate when We rely upon you as Our limbs and you look up to Us as your head. If the majesty and power of Our Empire be impaired, you share with Us the sorrow; if the glory of Our arms shine resplendent, we will share with you the honor. However, the relationship between leaders and led is more than “direct and intimate.” The soldiers and sailors are relied upon as “limbs,” and should look up to their commanders as their “head.” In short, soldiers are conceived as if part of the same body. When a soldier carries out the will of his superior, he is not simply “obeying.” He can no more resist the order of his superior than an arm can resist the brain’s command. The body of the SS-man belonged to the Reich because his own body was not separate from the body politic. This is the meaning of “obedience.” The nation was an enormous body politic existing within the body of the SS-man, and thus could not be resisted. Thus, the “organic theory of the state” that political theorists write about—seemingly an obscure, mystical ideology—has very real, practical consequences. The goal of the ideal self in Japan prior to the Second World War was to “absorb the self into the emperor:” to become “a part of the emperor.” Similarly, the Nazis’ ideal German citizen sought to absorb Germany into himself: to identify with Hitler. “National identification,” for the soldier, meant giving over one’s body to the body politic. When the body politic exists within the self, this larger body overwhelms the smaller body, compelling the smaller body to do the bidding of the larger body. The aspiration of totalitarian ideology is to destroy the boundaries between self and society; between one’s own body and the body politic. Totalitarian ideologies seek to actualize a symbiotic fantasy of no separation. Totalitarianism glorifies the ideal of “the community” at the expense of individuals, building upon the fantasy of a “national organism,” the survival of which is given priority over the survival of individual human beings. Hitler asserted that “the individual is transitory, the People is permanent.” When he spoke of “the People,” Hitler was referring to an abstract idea or ideal—his “national organism”—not to concrete human beings. The German nation was conceived as an actual body that could live forever. Japanese and German totalitarianism grew out of a mystical theory: the idea of nations or bodies politic as real entities that have the capacity to live forever. Nations are conceived as omnipotent bodies that embrace and contain everything. Political violence seeks to assert the reality of these mystical entities: to kill off those human beings who do not acknowledge or agree that this entity is omnipotent.